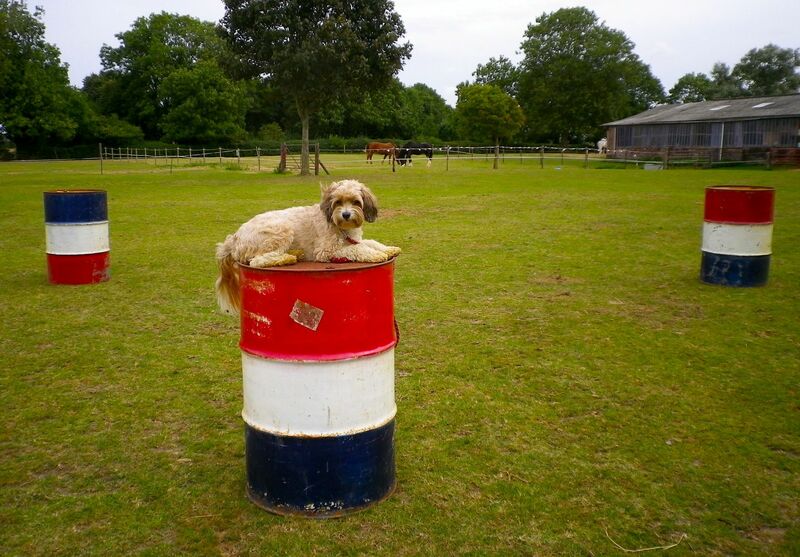 Lola rests on a barrel while planning today’s mayhem. The most surprising thing we did this summer was barrel racing. I had to google it to be sure that the dogs do not somehow have to power the barrel around a course like a hamster in a ball. The sport is a direct steal from rodeo where horses are ridden in a clover-leaf pattern around three barrels against the clock. Having discovered this I took pains to ensure that Lola knew her way around a rubbish bin in the park, some trees and a post. At the start of our barrel racing session held by the Ichthus Canine Centre I was asked if Lola could do both clockwise and anti-clockwise circuits. Ummm. Turned out that Lola’s turns are like Lola’s ‘roll over’ – one way only. I hadn’t noticed until this point that Lola is happiest going clockwise. Typically for her, learning a new direction would probably take around a week to be reliable. As if this were not handicap enough, Lola chose this moment, our first run-through, to be totally distracted by a horse which was being ridden past a hedge two fields away, and sprinted away barking her head off. My only solace was that having reached the far hedge to find that the exciting visitors had gone, Lola came bounding back through fields of (stationary) heavy horses on a single command. I experienced a strange, contradictory combination of mortification and pride. My feelings shifted sharply towards mortification during our second attempt around the barrels. The Centre has a lot of volunteers who come to help out at the weekend, many of them young girls. A few ponies were being moved to another field and the girl leading one of them dropped the reins and her pony made a break for it. Off went Lola for a speedy re-run. Although it didn’t take long for order to be restored I couldn’t afford to have Lola practise this reckless behaviour for a third time, so we ended the session on-lead. 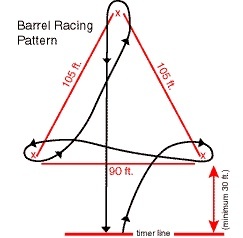 What I like about barrel racing is that it needs minimum equipment and only a couple of commands. Instead of barrels you can use cones, bags, bins, or conveniently placed trees, so it’s an activity you can practise wherever you happen to find yourself. We have continued to practise in the park and Lola has now mastered anti-clockwise pass now and we are trying to build a little speed.